Projected capacitive sensors are made up of three major components; the sensor glass, the cover glass, and a flexible printed circuit with an accompanying controller. The sensor glass is electrodes arranged in rows and columns. The electrodes are made of a transparent conductive material called Indium Tin Oxide or ITO. The electrodes trace back to a point where a FPC (Flexible Printed Circuit) is bonded to the main sensor. In most cases the FPC will contain the controller for the sensor. The cover glass is optically bonded on top of the sensor glass, burying the electrodes within the stack of the lamination. 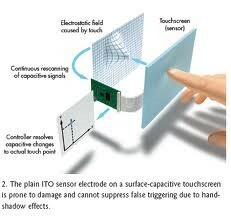 The cover glass serves as a dielectric between your touch and the electrodes of the sensor glass. It also doubles as a barrier layer, protecting the sensitive electrodes from the environment and any potential damage. The controller continually scans and monitors the capacitance of the electrodes. When your finger touches the surface of the cover glass it pulls a small charge from the electrodes and using complex algorithms the controller can determine the exact location of your touch. eN-Touch Surface Capacitive Touch Screens can withstand extensive usage while maintaining outstanding optical clarity and endurance. These screens are a great choice for kiosks, ATM’s gaming or other applications where reliability and high usage are expected. An all-glass construction containing transparent conductive ITO on both sides of the glass provides ideal optical qualities. We pattern an electrode circuit around the perimeter of the glass to accurately generate an alternating current over the conductive layer. The touch of a finger or electric probe draws the current to the specific point of contact. A controller is required to calculate the location of the touch by evaluating the current from each corner.